A newsletter just for elementary school students. It includes lots of information and ideas about bullying prevention activities and resources, such as ways to get involved, an advice column and more. Students can download and view online. The newsletter can be shared in classrooms and libraries. 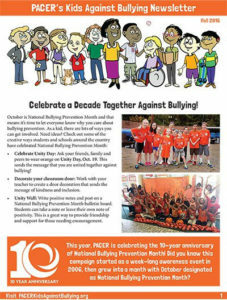 Students can encourage their friends, teachers, coaches, and parents, to sign up for PACER’s Kids Against Bullying newsletter.